Brigid Cards cost €11.95 for a pack of 6 incl. packing and postage to anywhere in the world. To purchase click here to go to the products page. Please visit my other website - www.magicalirishlandscape.ie to see 6 more beautiful cards illustrated by Hélène Byrne which form a never-ending panorama filled with the history and magic of the Irish countryside. I liked Hélène Byrne's design for the CD cover so much that I thought it would be lovely also as a card to send with either a Brigid's Cloak or Brigid Meditation CD, a greeting for the 1st of February or simply a reminder of Brigid throughout the year. 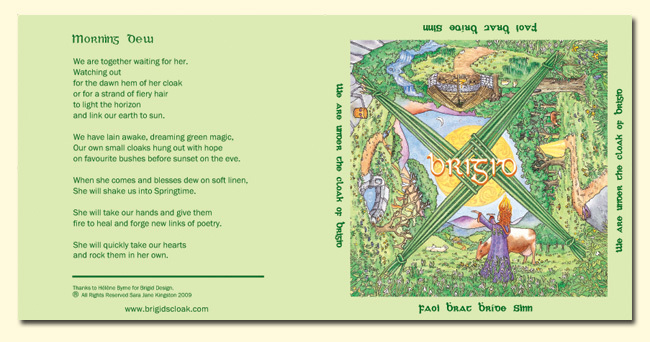 The words: “We are under the cloak of Brigid" – " Faoi bhrat bhríde sinn” are written around the border of the magical landscape which brings the stories and symbols of Brigid to life…on the back of the card, the following poem which I wrote about the Spring ritual of putting out the brat bhríde or Brigid’s Cloak.